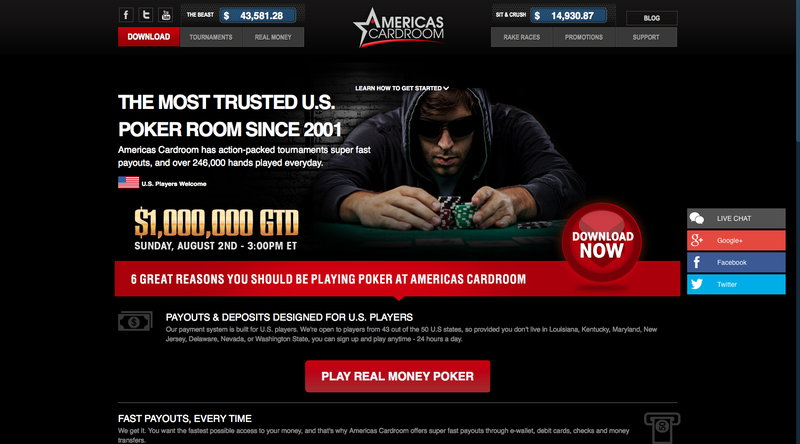 Americas Cardroom has become a very popular option, particularly among poker fans in the US. The site is part of the Winning Poker Network and licensed in Costa Rica. The rise of ‘ACR’ has been the result of seeing many games introduced for high volume players, reliable service and large prize-pools, including the only $1 Million Guaranteed tournament on a US-friendly poker site. The games on Americas Cardroom can be accessed on Windows computers, by downloading their client. Once launched, you find yourself in an easy to navigate lobby, with tabs separating out different games and buy-in levels. In the top corner you can see the ‘Sit & Crush’ and ‘Beast’ jackpots displayed and the cashier can be accessed underneath this. Unfortunately there is no way for Mac or mobile users to play, a serious downside in the modern online poker market, although software is constantly being updated. Here you can discover all that Americas Cardroom has to offer. First the cash games and tournaments are covered, then you can see what bonuses and promotions are on offer. Finally the all important question of how to get money on and off the site is answered. You can find a range of cash games with No Limit Hold’em games ranging from $0.01/0.02 up to $25/50, across 6-max, full ring and heads-up tables, including capped tables. You can also find a selection of Omaha and Stud tables, along with Limit and Pot Limit Hold’em, with varying levels of traffic at different points of the day. Even up to $3/6 stakes games the level of competition tends to be on the soft side, with over 40% of players frequently seeing a flop. Above this the games do tighten up, although there is rarely much action at these levels. There is no fast-fold format available – overall the cash games cater well for those enjoy straight up poker, with few gimmicks. ACR hosts a variety of scheduled tournaments which cater for every bankroll level. The key daily tournaments are the Big 10s, which offer a series of regular guarantees with buy-ins ranging from $3 with $500 guarantees, to the $109 Sunday Big 10 with a $25k guaranteed. For those who enjoy quicker blinds (or shorter tournaments) the Turbo 10s offer a similar range of games with faster structures. During different times of the year Americas Cardroom is the only US site to host a Million Dollar Guaranteed tournament. While the buy-in of $540 for the Million Dollar Sunday may be high for some, the site has many satellites, giving you plenty of chances to win your seat. This site also has plenty of Sit n’ Go’s waiting to run. These include 9-man, 6-max and Heads up games – with multi-table SNGs alongside single table games. The speeds vary too with turbo options, and you can find On Demand games, which you can join for a limit period of late registration after the start time. Unfortunately traffic tends be low for many of these games, even at peak times. The good news is Americas Cardroom has now launched Jackpot SNGs. These three handed, hyper-turbo games, which give you a shot at big money from small buy-ins of $12 and $0.50. Both sets of games give away prizes up to $1620, with the $12 games offering a better chance of this happening. Also during the Million Dollar Sundays, all the players lucky enough to hit the maximum jackpot games receive a $540 seat. As a new player on ACR, you can claim a First Deposit Bonus up to $1000, providing a 100% match on your first payment to the site. The bonus is released into your account as you play real money cash games or tournaments. Each time you pay $1 in rake or tournament fees, you will gain 5.5 Award points, and for every 27.5 points gained you will receive $1 in bonus money. The points also contribute towards the ACR’s loyalty scheme. This tiered system is arranged in military rankings, and the further up you climb, the quicker you gain points and the greater the rewards. You points can then be exchanged for cash bonuses, live event entries or merchandise form the store. In addition to its packed tournament schedule Americas Cardroom has many other promotions constantly running. These include rake races, like The Beast and Sit & Crush, where players can take down a huge progressive jackpot at the end of each month for becoming the highest ranked player on the promotional tables. As well as the windfall, other players can also receive tournament seats and cash prizes. The standard limited set of US deposit options are available at Americas Cardroom. These include Person-to-Person transfers (which use the big name money wiring services), Visa credit cards (via an international transaction) and pre-paid Visa cards too. ACR recently started to accept Bitcoin. Deposits using BTC are transferred into dollars as soon as they hit your account. Players outside of the US can choose e-wallets including Skrill. Cash outs can be completed back to your Bitcoin address or e-wallet very quickly and with little or no fee. The other options include payment by check, or refunding you back to your card, which both require minimum $100 withdrawals. ACR is now a major player among US offshore poker rooms. It offers players a healthy tournament schedule, and large guarantees, and shots at jackpot prizes. Meanwhile the cash tables offer a no-nonsense poker experience. The Million Dollar guaranteed tournaments are becoming more frequent and attract large (and very soft) fields. Despite gaining in size, ACR can still very quiet at certain points in the day, and traffic for games like SNGs can be a lot lower than regular players would like. The lack of a Mac or mobile interface does not help this either, and I hope that Americas Cardroom are looking for solutions to these in the near future. Americas Cardroom is a top choice for US poker players, especially tournament specialists. It has grown significantly in the last few years and, with a handful of restricted countries and states, welcome players from all around the world.